Last Sunday Michele appeared on the nationally-heard radio program Behind The Paranormal with Paul and Ben Eno. 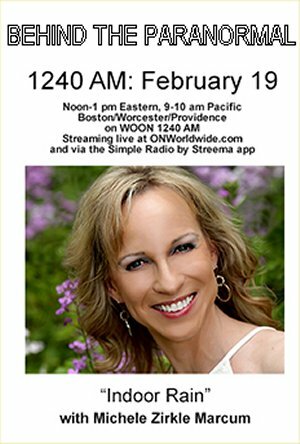 This show originates from Boston and can be heard online on OnWorldwide,com Radio. Michele discussed her book, Rain No Evil and her encounters with the unexplainable that lead her to create Life Speaks. This week we bring you the first of three installments of her appearance on the show. Also continuing this week is the “Heal Your Heart” contest with prizes including copies of her book, Rain No Evil, and a one hour heart-healing session with Naturopathic doctor Dr. Jeanie Short. At Midnight Wednesday we begin a 24-hour marathon of Radio Free Charleston International. This is one full day of nothing but your humble blogger playing whatever he wants to.